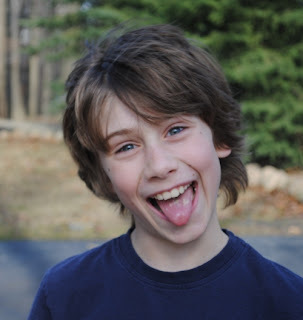 It is hard to believe that my baby is 11 today. How is that possible? Happy birthday to the boy who keeps me laughing! 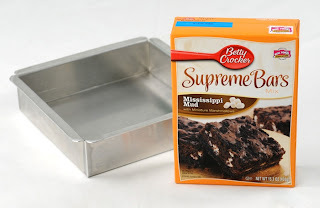 When I was asked by MyBlogspark if I'd like to try Betty Crocker's new Mississippi Mud Supreme Bars, there really was no question! Our family loves both chocolate and brownies. 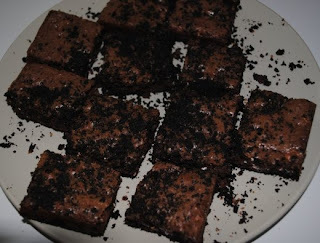 These aren't just any brownies, they have an extra pizazz you wouldn't expect from the convenience of a boxed mix. The rich chocolate center with gooey marshmallows between layers of cookie crumbs make these brownies an extra special treat. When our package came and I told my kids it was a product for us to try out, you should have seen the look of fear on their faces. Summer is just beginning...is mom going to make us give another math product a trial run? They were suspicious when I told them this was not our typical review product. Then to find they were going to try out some brownies, well, let's just say it was very well-received. So well-received, in fact, that my daughter decided *she* was going to be the baker on this one. I went to run some errands and left her with the box and 8" x 8" pan that came with the package. All she needed in addition to the mix was 3 tablespoons of water, a stick of butter, and an egg. Before I even made it home, she was calling me raving about the brownies and wanting me to pick up some ice cream and chocolate syrup to go with them. She was right. They are very yummy! They didn't last long in our house either. In fact, before I was able to get the camera out for a snapshot of the final results, several were missing from the plate already. Now is your chance to give these brownies a taste test. One lucky reader will win a dessert prize package that includes a box of Betty Crocker's Mississippi Mud Supreme Bars and a sturdy 8" x 8" pan, just like pictured below. 1. Leave a comment telling me your favorite dessert. 2. Blog about this giveaway, leaving a link to your post. 3. Publicly follow my blog. 4. Subscribe to my blog via rss feed. You can earn up to four entries! Make sure you leave a comment for each item, along with a way to contact you. This giveaway will end on June 25th at 6 pm EST. Winner will be selected by random drawing. Congrats to Michelle Smith for winning this dessert package! Enjoy! Betty Crocker provided me with the free product, information, and prize pack through MyBlogSpark for this review and giveaway. Are you ready to take a Journey to the Stars? The American Museum of Natural History and NASA have joined forces to produce a planetarium show about the amazing variety of stars that dot our cosmos--exploding stars, giant stars, dwarf stars,neutron stars, even our own star! But you don't have to go to a planetarium to experience this mind-blowing journey. NASA will send you a DVD, for free! Do your kids need math practice over the summer? Math is a subject that I continue through the summer with the kids. Otherwise, I'll need to reteach material in the fall. One way I'll be doing that this summer is by using MathScore. MathScore is a product I reviewed this year through the TOS Crew. You can read more about the product here. I've just been made aware of some special pricing for MathScore, available through July 31st. This exclusive limited offer is drastically reduced from the regular pricing and cannot be found on the website. You need to go through this special link. Instead of $14.95/month for the first student, you can lock in at $5.95/month! Additional students are at a discount too. If you are in the market for some math practice for your students, either through the summer or beyond, this is deal you'll want to look into!